A murder victim's wife is forced to become the detective after the police close the case as an accidental shooting. 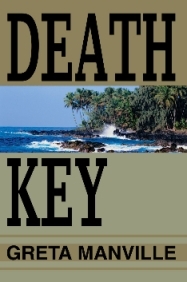 Caro Weston returns to Key West from her New York home, determined to find evidence, but before she can act, a dark foreigner abducts her, taking her to a remote, uninhabited island. The man, seductive Collin Sanders, with an alluring past, attempts to convince her he is not the killer. Beguiling Caro with his gentleness and show of sincerity, she finds herself reluctantly falling in love with him - until a discovery at Death Key sends her trust reeling. The author's love for Key West with its subtropical beauty, unique charm, and romantic aura inspired the setting for this book. She too, has seen the destruction nature wreaks on what might otherwise be called "paradise." Contents Copyright © 2005-2007 Greta C. Manville. All rights reserved.